Are you thinking of doing some holiday shopping for that favorite geek of yours? You're in luck, since Synology recently announced two new 2-bay BYOD NASes. 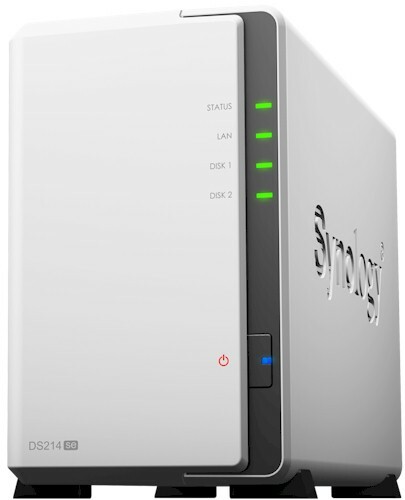 The subject of today's review—the DS214se—is its lowest-priced dual-bay NAS that's only $10 more than Synology's entry-level single-bay DS112j. Synology sent its first review sample to us, so let's get going. Synology's announcement said the "se" stood for "single-role edition", but there is no mention of this on the product's page. Instead, you find "A Budget-Friendly, Personal Cloud" as the product's catchphrase, which perhaps suits it better. The se's material cost has been trimmed to the bone by using a single-core Marvell Armada 370 SoC with only a minimal 256 MB of DDR3 RAM and 8 MB of flash. Priced at only $160, you can't expect it to burn up the performance charts, but it's not a totally stripped-down NAS, either. It runs the Synology's standard DSM 4.3 operating system including all add-in apps. The front and rear panels are relatively simple, so I've combined both of them into a single screenshot along with the LED status indicator chart. I like that Synology uses a combination of color and blink/static states to show you what's happening at a glance. An orange LED for either of the Disk indicators means that you have a disk failure. The front LAN indicator shows connectivity and activity. The rear panel has a single Gigabit Ethernet port with two LED indicators, two USB 2.0 ports, a reset hole, power jack and a Kensington lockdown hole. Note the lack of USB 3.0 and eSATA ports. The image below shows the top of the DS214se's PCB. You can clearly see the Marvell SoC in the center of the board. The image below shows the two 2 TB WD Red (WD20EFRX) drives that Synology supplied in the review sample, mounted over the PCB. Since the se isn't a hot-swappable design, you remove two screws on the rear panel, then slide the case apart to mount the drives. The integrated drive brackets support 3.5" drives only. If you want to mount 2.5" drives, you'll need to purchase special brackets for those. The se drew only 14 W with the two WD Red drives spun up and 7 W when the drives reliably spun down after the programmable idle time elapsed. Noise level was judged as low since it was barely audible in the quiet home office test area. The fan never spun up to a higher level even under load during testing. The table below summarizes the se's key components. I've included the key components for the $150 Buffalo LinkStation LS421e and the $140 Zyxel 2-Bay Power Plus Media Server NSA325 for comparison. As you can see, the DS412se is running at the slowest clock speed of the three devices and has half the RAM. It's also missing the USB 3.0 chipset, as the DS214se only supports only two USB 2.0 ports.